The film suggests — just barely — that there may be a sexual attraction between the two women. Eager to please, Isabelle is excited but nervous when Christine sends her out of the country to conduct an important piece of business. She’s less thrilled when Christine takes credit for her triumph. By this time Isabelle, relishing her newfound confidence, has taken up with Philippe, although you can’t shake the feeling that the romance is being orchestrated from the wings by Christine. When Christine publicly eviscerates her assistant at a big office party, the gloves come off. Isabelle teams with another junior exec (Guillaume Marquet) to wage a covert war on the overbearing veep. Eventually it leads to a brutal murder, a coverup (the French cops are, apparently, idiots) and Isabelle’s ascendency to power. The mouse has become a lion. This might be more fun if Sagnier were a more dynamic screen presence. But too often she seems to be in retreat on the screen. That’s certainly the case here, where the darkening of Isabelle’s personality is to be found less in an assertive performance than in the growing sophistication of the character’s wardrobe and hair style. 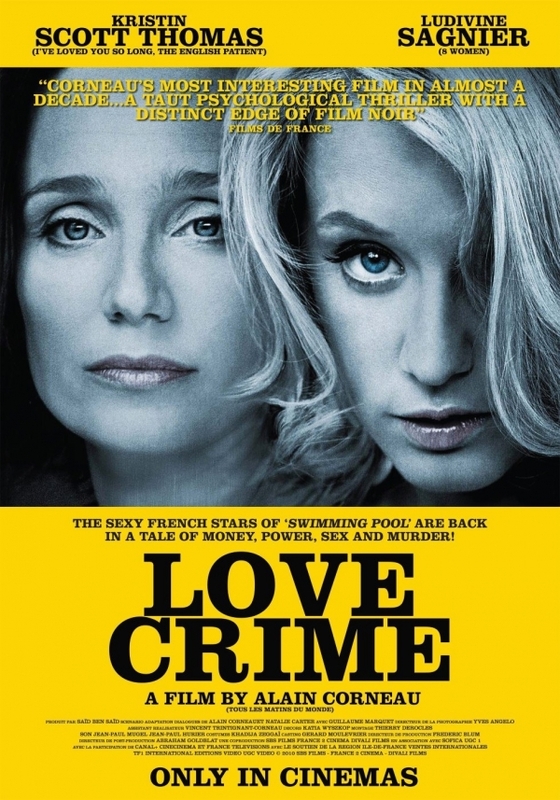 Viewed charitably, one might conclude that “Love Crime” is about the dehumanizing effects of corporate capitalism. But that’s a stretch. This is simply a modest workplace potboiler. You could imagine it being remade for the Lifetime cable network with Susan Lucci as Christine and any number of vacuous but attractive young actresses in the Isabelle role. I’d suggest that is the point of the movie. So, I’d say the title of your essay, “About as French as ‘Dallas’” is quite right, but rather than a slam at the movie, it points to its one strength. I’d suggest that Corneau, in his last film, is making that very point, in the age of the Euro, Paris is about as French as Dallas. That was the similar to the political point he was making in his previous critically acclaimed 2005 film, “Fear and Trembling,” that played-out similar themes in Love Crime. As you’ll recall, in that film, it was also a human drama set within the New World Order, of late-capitalism’s corporate Japan. Twenty years ago the highly influential French Cultural Theorist, Jean Baudrillard, wrote, that in the Postmodern world, “The world dreams itself American.” He was trying to explain the schizophrenic fissure between the world’s distaste for America as a Nation, and it’s embrace of American Pop Culture. Rome faced the same problem.